It’s Saturday night, wrap up time for my message. 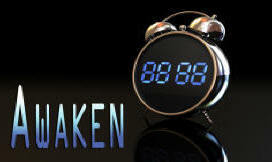 Tomorrow, I am preaching part 2 of Awaken (an invitation to spiritual vitality). I have a lot that I would like to say and there is a lot that I am not able to say. Ephesians 5:16 “Make the most of every chance you get. These are desperate times!” (The Message) This verse probably speaks for itself. Judges 16 where Samson slept while his girlfriend removed his power. Matthew 25:7 where the five foolish young girls overslept for their weddings. So there, I just shared it. Now, let’s wake up and get busy doing what God has directed us to do!